Game progress is only saved in-between levels. It's due to a technical limitation in the game engine. 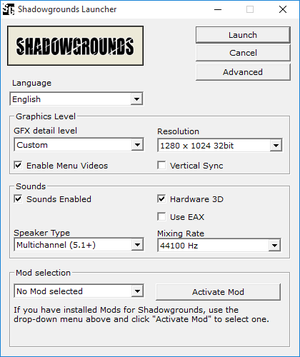 Mouse sensitivity can't be modified. Russian copies use StarForce 4 DRM[Note 2]. 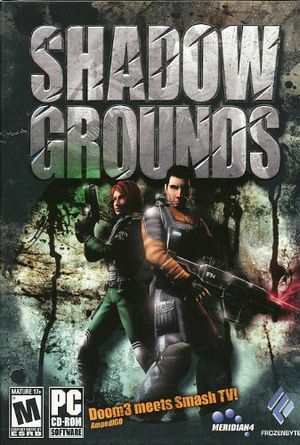 The Shadowgrounds website provides the latest patch, version 1.05. Delete or rename logo.wmv in <path-to-game>\Data\Videos. 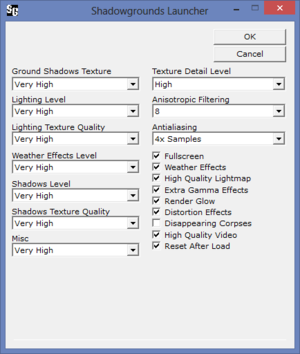 Change screen_height = and screen_width = to the desired resolution. Extract default_game_options.txt to any folder. 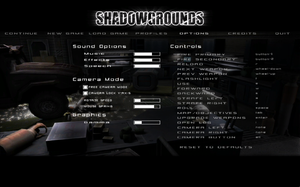 Change camera_default_fov = 120 to the desired FOV. Save the changes and replace the original file in the archive. Change the following values as noted. Shared-screen. Other players must use controllers. ↑ 4.0 4.1 File/folder structure within this directory reflects the path(s) listed for Windows and/or Steam game data (use Wine regedit to access Windows registry paths). Games with Steam Cloud support may store data in ~/.steam/steam/userdata/<user-id>/2500/ in addition to or instead of this directory. The app ID (2500) may differ in some cases. Treat backslashes as forward slashes. See the glossary page for details.